Informative booklet covering most common issues for families of gay youth. Published by Vancouver School Board. The Transgender Child: A Handbook for Families and Professionals, by Stephanie Brill (Cleis Press). 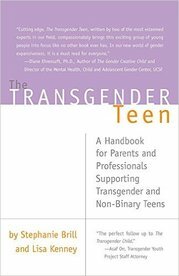 This comprehensive first-of-its-kind guidebook explores the unique challenges that thousands of families face every day raising their transgender or gender variant children. Through extensive research and interviews, as well as years of experience working in the field, the authors cover gender variance from birth through college. What do you do when your son announces he is transgender and asks that you call her by a new name? Or what if your child uses a term you've never heard of to describe themselves (neutrois, agender, non-binary, genderqueer, androgyne… ) and when you didn't know what they meant, they left the room and now won't speak to you about it? Perhaps your daughter recently asked you not to use gendered pronouns when referring to 'her' anymore, preferring that you use 'they'; you're left wondering if this is just a phase, or if there's something more that you need to understand about your child. QMUNITY – QMUNITY improves queer and trans lives through services, connection and leadership. The QMUNITY building provides a safe space for LGBTQQ2S (lesbian, gay, bisexual, trans, queer, questioning and two-spirit) people and their allies to fully self-express while feeling welcome and included. It serves as a catalyzer for community initiatives and collective strength. It’s not only a physical space but also a space created by the coming together of LGBTQ individuals searching for community. We offer: information and referrals; diversity training and consulting services; all ages events and drop-in programming; counselling and social support groups; volunteer and practicum opportunities; community meeting space. Also home to the Bute Street Clinic (run by BCCDC), which offers free and anonymous STI/HIV testing for the LGBTQQS community; Staffed opening hours 10am to 6pm Monday to Friday, after hours bookings upon request. Our Youth Program provides a safe place for lesbian, gay, bisexual, trans, two-spirit, intersex, queer, and questioning youth 14 to 25 years of age to hang out, find resources, share experiences, develop leadership skills, and get support. The Transgender Health Information Program – THiP is a BC-wide information service and resource hub. THiP strives to support people in getting the information they need to access gender affirming health care. THiP support services include those for people who identify as transgender or gender diverse or who are questioning their gender identity. All information services are free and available to individuals, families, friends, loved ones and service providers. Services provided include: Information sessions (over the phone or in-person), email support, referrals to gender affirming care and supports, web and print resources, health care provider consultation services, support and information groups. Group focuses on building resiliency skills within parents and providing resources and support that are specific to gender diverse youth. Group facilitated by Family Services of the North Shore Therapists, trained by Elisabeth Cooke of Inclusivity and Dr. Melady Preece. MyDavieVillage.com – The purpose of this website is to provide a resource base for Vancouver’s gay community and GLBT visitors to Vancouver; to provide a central point for queer / gay people in our community to easily find links to the information they need to create their own social and support networks through sport, art or any other nonpolitical LGBTQ community based group; to provide a central point for our not for profit grassroots community and social organizations where they can be easily found by Vancouver’s Gay GLBT community. Generation Out – The ‘Generation Out’ drop-in group is for youth who are lesbian, gay, bisexual, transgender, two-spirited or questioning. Please see below for information about meeting times and locations. It is held every Monday night from 6pm - 8pm. It is held every Tuesday night from 6:30pm – 8:30pm. Every Thursday night from 6pm - 8pm.